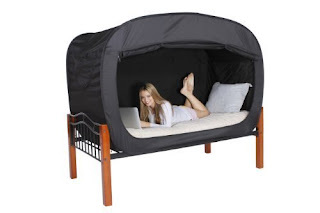 What do you think of this Privacy Pop Bed Tent? Perfect for when you need a little privacy but share a bedroom with someone else. Works great for blocking light. Great for someone who has to sleep during the day or shares a room with a night owl. Simple and fast set up and take down. Mesh and zip window sides offer ventilation for easy breathing and light when you need it. Electronic port opening to access cell phone or laptop cords. BONUS QUESTION! Who has the best price? Today it is definitely the US Amazon site at 35% off!